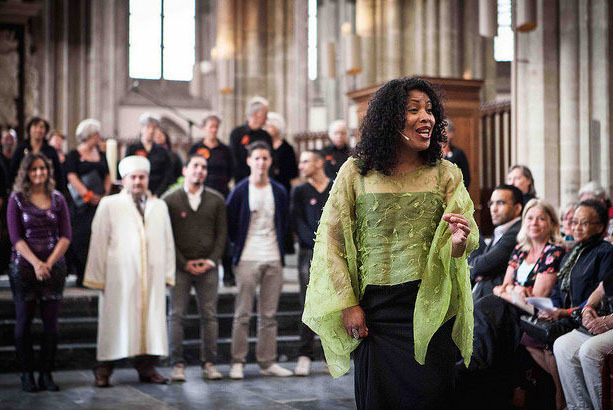 Sacred Songs celebrates the diversity of the city of Rotterdam with a production in which sixty Rotterdam vocalists from different cultures, religions and philosophies work together. Under the direction of internationally renowned voice artist Monica Akihary they present songs and poems inspired by the theme ‘Pilgrimage, Going Going’. Monica Akihary creates with their repertoire one brand-new composition in which black gospel, Indian sacred music, Sufizang, Jewish repertoire, Moroccan anasheed and songs from the Cape Verdian parish and Catholic Church resound. The vocal production Sacred Songs Rotterdam will premiere in the atmospheric Pelgrim Father Church in Delfshaven.